The needle in your sewing machine is an important part of how your sewing machine functions. If it gets dull, gets a burr, or breaks, then you need to change your sewing machine needle, and this article explains a bit more about the why and how of performing this simple sewing machine maintenance task. Broken needles: A broken needle in your machine is usually fairly obvious, the tip and eye will be gone if the needle breaks. If your vision is like mine, though, you may need magnifying glasses to be sure if the break is only on the tip. Dull needles: A dull needle can damage the fabric as it cuts the fibers in your fabric instead of pushing through properly. It can also cause the needle to make a heavy, thud sound as it hits the fabric. Bent needles: A bent needle can damage your sewing machine and even send shards of sharp metal flying around you if it hits your machine's presser foot or face plate and breaks. This is why you should ALWAYS wear glasses of some kind when you sew and keep young children at a safe distance. I had a needle break on my industrial machine once and it shattered a light bulb! Burred needles: A burred needle can cause skipped stitches. A burr on a needle feels like a tiny hook if you slide your finger over it. If you suspect a burred hook you should change the needle even if you can't actually feel a rough spot on your needle. Sewing different types of fabric: Needles are made for different types of fabric, such as a ballpoint for knit, sharps for woven, and a universal point if you frequently switch fabrics. Needles also come in different gauges to accommodate different fabric thicknesses. 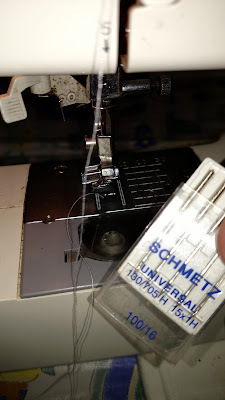 It's just time: Experts recommend changing your sewing machine needle after every eight hours of sewing time, even if it's still working okay. Friction and the constant impact of the needle tip hitting the fabric weakens the metal and dulls the tip, so it's really ideal to change needles frequently. 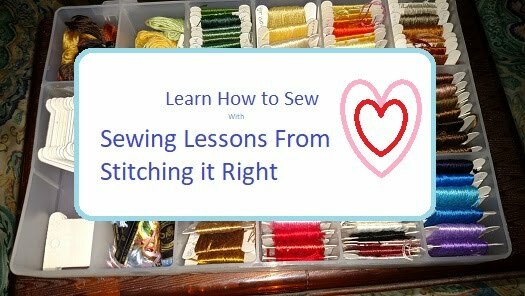 If you enjoy the video and would like to see more sewing lessons, please like the video and subscribe to my channel. Questions and comments are welcome here, on the Facebook page, or in the comments section under the video on YouTube.